My original thought was to find a decent F16, since I race only single-handed. At 190lbs, I don't think I'm too heavy. My wife has no interest in racing, so I don't mind if the boat is slower with 340lbs total on it and we're just out for fun. I would probably have to work on my tacking some since I wouldn't use the jib when I'm by myself. Edited by ropewalker on Jan 07, 2018 - 12:05 AM. Quote My original thought was to find a decent F16, since I race only single-handed. At 190lbs, I don't think I'm too heavy. How much do you race vs non race sailing? - how important is racing to you? How much do you sail w your crew? how important is her comfort and rigging complexity in the sailing picture? I only say this cause - It's easy to get discouraged if the gear is highly technical or hard to use. when boats (or anything) becomes more work than fun .... things stop being worth doing. If you think you want to race a good amount (and may want to race strict class) - and are up for it, go for a Formula cat otherwise in your price range you can also look for many other cats, with newer sails, maybe wings and spins! Edited by MN3 on Jan 07, 2018 - 11:38 AM. I don't think we have enough of any one type to do a class race. There's probably more H16's here than anything else, but I don't want an H16. I'd like newer style hulls, and the ability to point higher as well as go downwind. I like the H18, but it doesn't have much power in light air or downwind. I like to go fast, but dial it back when my wife is with me. I've repaired the leaks, replaced rigging, and it sails well with a good breeze. New sails would be nice. I don't need a formula boat, but that's what gives me the features I am looking for. I understand that having a spin adds more complexity, but I think I can leave it off if I don't want to use it. I do want to beat that J80 next time though. I'd like to say thanks to everyone who's participated on this thread. The input so far has been excellent. Edited by ropewalker on Jan 07, 2018 - 09:31 PM. Edited by MN3 on Jan 08, 2018 - 10:20 AM. I'd like to say thanks to everyone who's participated on this thread. The input so far has been excellent.Edited by ropewalker on Jan 07, 2018 - 09:31 PM. On most modern boats-the F16 and F18 for example, you can't leave the spinnaker pole off because it also supports the sheeting for the self tacking jib (something stock older Mysteres don't have, and make single handing much easier). So your option is to leave the spinnaker in the bag, or you can leave it on the beach which saves connecting the sheets and halyards. My experience is, for the average sailor, a spinnaker boat is best kept mast up at a local club unless you get hooked into the regatta circuit. Otherwise, spending 2 hours rigging from scratch everytime you go sailing is no fun. I can do it in 1hr, but there is always something to tweak/tune/adjust and people to chat with, 2 hours is what it really takes. The uni-rig F16's have pretty well been proven slower than their sloop rigged counterparts. I can't explain exactly why but I think the rigs, rig placement and sail design on the F16's are all sorted for sailing with the jib. No matter, you can sail with or without, just leave the pole attached. Singlehanding with the spinnaker is a lot of fun btw. Edited by samc99us on Jan 08, 2018 - 01:08 PM. my 5.5 cost me 3200 - with a very usable main and jibEdited by MN3 on Jan 08, 2018 - 10:20 AM. One local guy has a G-cat, which does point well w/o daggerboards, but it's an 80's boat. I read something about a new F16 from Geissler, but I don't think it got going. I wasn't really suggesting mystere's to you as much as the point of you don't have to go to a race machine to get everything you "want"
Edited by samc99us on Jan 09, 2018 - 09:19 AM. samc99us Great history lesson MN3. The G-Cat 5.7 was a pretty nice boat when I sailed it a few years ago, powerful, reasonably fast upwind etc. They are nice cruisers. That being said, I assume the F16 models didn't quite perform as advertised? I think running a kite on that hull shape wouldn't prove particularly fast, thrilling perhaps but not fast. Is carbon fiber still too expensive to make a mast out of? I don't see many boats with it available. It seems like that would help quite a bit, with reduced weight aloft. It would certainly be easier on my back when it comes to stepping. I can't leave the boat setup. Edited by ropewalker on Jan 10, 2018 - 07:36 PM. I keep reading this thread with interest. My F16 looks clean and simple rigged main only with minimal rigging time. The guys in my fleet don't think the boat is slow rigged that way. Just because you have it, doesn't mean you have to fly it. My Tiger I rig everything but can leave the spin in the chute and the jib furler on the forestay. Very manageable solo. Wind under 10 and I fly it all. Do I wish I had wings ... yes but all boats are a compromise. If I wasn't a solo sailor 95% of the time, I wouldn't have bought the F16 and have the Tiger for sale. If I had more money, I would have bought a C2 rather than the Tiger, etc, etc. Get the most pros and fewest cons, buy the boat and go sailing. It is a lot more fun than looking for a boat. Yeah, looking isn't much fun, especially when most of the interesting boats are clear across the country. I'm going to ask for lots of pictures before making a trip. Good to know you're happy with the F16. It seems like a good compromise. ropewalker Is carbon fiber still too expensive to make a mast out of? I don't see many boats with it available. It seems like that would help quite a bit, with reduced weight aloft. It would certainly be easier on my back when it comes to stepping. I can't leave the boat setup.Edited by ropewalker on Jan 10, 2018 - 07:36 PM. F18 class rules ban carbon masts. F16 class rules have a minimum tip weight rule in the mast so there is little incentive to go carbon in the mast. In terms of a cost, a blank (as in raw from the anodizer, no fittings, holes etc.) F18 mast section in aluminum is ~$800. A blank A-Cat mast section (similar length and section, less reinforcement, but carbon) is ~$3500. Labor and autoclave time is more expensive than extruder time. Materials cost on the carbon front is higher, probably by about double. The biggest downside to aluminum is finding someone to extrude and anodize the tubes, plus you can't just buy one, you have to buy a whole lot. 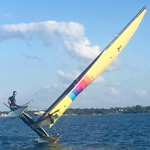 The F16 class rules wanted to allow homebuilds as a serious option, which is why carbon masts are class legal, as its possible to homebuild a one-off carbon mast to the same minimum weight as the aluminum section and have confidence in the stick. Is it worth the effort? Probably not, and the aluminum rigs have proven themselves at the worlds level in the F16 class. They are also plenty light for solo stepping, though the A-Cat is the ultimate in ease of solo rigging. base supported at the bottom edge of the mast section is referred to as the "mast tip weight". Edited by MN3 on Jan 11, 2018 - 11:55 AM. This question is slightly off topic. What is the difference between a Hooter, Code0 and Code1 sail? I have watched the M32 and G32 use Code1s up wind and downwind in light air and only use it down wind in moderate to heavy air. Hey mate, I will give you my 2 cents on spinnakers for cats. Hooters, code 0's, reachers or a spinnaker for cats are really different names for the same idea. Back in the day we had cat sailors who learned that apparent wind speed down wind was much faster than going down wind even with a spinnaker. Early spinnakers were cut by monohull sailors who really did not have a clue about down wind apparent wind. ( I am generalizing, but this is essentially correct). 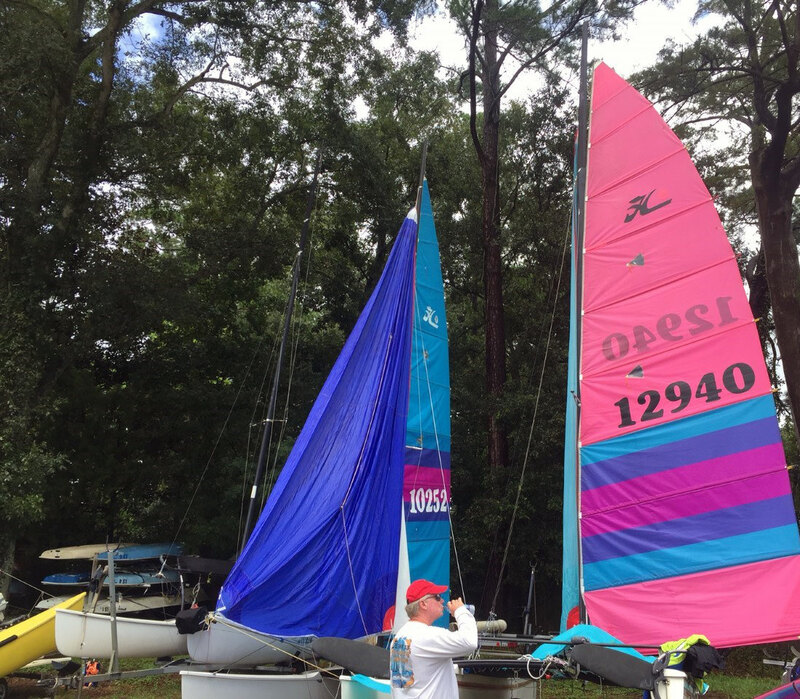 The first "stock" spinnaker I sailed was on a Hobie 21 when they came out new and where targeting a "pro-circuit" type of event. Even these early spinnakers "designed" for cats were way too full. (Again, sail makers were still thinking in terms of how deep can I go, instead of how fast I can go). It was then that I learned that a spinnaker that is too full has a self limiting top speed. This is where drag of the shape of the chute prevents a faster speed. This results in one having to sail deeper, however on a cat, this is not necessarily faster. Over the years, folks experimented with shapes getting less full. Basically, we needed a big down wind jib. Something that would not collapse as forward speed picked up. Hence the development of hooters, reachers, and code 0's . In light air these big jibs can help going up wind as well. These big jibs do not allow you to point as high, however you can build enough speed to over come the extra distance. Again with cats, going up wind is about speed not pointing angles. Monohull sailors often tell me cats do not point as well as monohulls. My response is, yes they will. But if you go that high you will sail as slow as a monohull too. The same applies down wind. You can go down wind like a monohull, the only problem is you will go slow like a monohull. This is interesting. Most of the cats I've looked at just say whether they have a spin or not, not which kind or what it's strong points are. But, I'm also not clear what the difference is between reacher, screacher, hooter, etc. The code 0 asymmetric is a tight reaching sail, that was developed in the Whitbread Round the World Race by Robert "Hooky" Hook for Paul Cayard's successful EF Language. In that race it replaced the jibs for light upwind work in addition to many off wind angles. The luff is as straight as possible, and the sail is flatter than other asymmetric spinnaker. Due to the flatness of the code 0, it is usually made with a high modulus luff line for supporting strength, and of a heavier, less stretchy fabric than normal for a spinnaker. Due to the tight luff and flat cut, the code 0 can be fitted for roller furling. Code 1 is a light air reaching sail, where the apparent wind angles at low speeds has a significant effect to create angles of less than 90 degrees. Code 2 is a medium air running sail, used for apparent wind angles over 90 degrees. Code 3 is a medium air reaching sail, used for apparent wind angles near 90 degrees. Code 4 is a heavy air running sail, used in the heaviest winds normally expected. Code 5 is a heavy air reaching sail, used in the heaviest winds normally expected. Code 6 is a storm sail, for running in storm conditions. A lot of people like the Code 0 on multihulls as it is usually on a roller furler therefore can be depowered easily and useful in a very wide range of conditions. Edited by bradinjax on Jan 12, 2018 - 07:36 PM. So, all of these terms (reacher, screacher, hooter, ...) are interchangable? As stated above by Bruiser, the flatter spin could be used upwind in light air. That sounds like a versatile sail to have. ropewalker So, all of these terms (reacher, screacher, hooter, ...) are interchangable? Well....not interchangeable but more a matter of regional definitions. Here in Florida where I live now a lot of people describe their downwind sail as a "Screacher" which is a combination of a reacher and spinnaker. Other places I lived the same sail would be described as a drifter or just a reacher with the spinnaker part understood. A Hooter was an early attempt at marketing something close to a code 0 but kind of failed in the marketing department and was not quite a code 0 but they were on the right track. Nobody with a modern sailplan has anything called a hooter today. It is widely regarded that a code 0 is the most versatile asymmetric spinnaker and has rapidly become the go-to headsail for the largest variety of conditions. But higher levels of competition require more sail options. A basic suite of sails for someone seriously competing on a local level would be 2 mains, 2-3 jibs, 3-4 spins. However, a fully sponsored race ready M32 (for example) will have at least 2 full sets of sails and practice sails. So that would be at least 3 mains, 7-9 jibs, 14+ spinnakers. All those sails have names or some designation so everyone knows what sails to use for given conditions. Of course some of those sails would be duplicates as spares and others for specialized conditions. Sail shapes and uses is a constantly evolving process. As new materials become available and more specialized applications become necessary the nomenclature changes. I am sure somebody somewhere is working hard on something with a new name we will all be talking about very soon. The manufacturing of sails is more an art form than a science. Two sails that measure exactly the same can have very different properties and those properties will change over time based on maintenance, storage conditions, use, and weather conditions. Edited by bradinjax on Jan 13, 2018 - 12:33 AM. Quote Well....not interchangeable but more a matter of regional definitions. Here in Florida where I live now a lot of people describe their downwind sail as a "Screacher" which is a combination of a reacher and spinnaker. Other places I lived the same sail would be described as a drifter or just a reacher with the spinnaker part understood. A Hooter was an early attempt at marketing something close to a code 0 but kind of failed in the marketing department and was not quite a code 0 but they were on the right track. Nobody with a modern sailplan has anything called a hooter today. We brought 2 Mystere's to The Small boat fest in Cedar Key fl a few years ago and they saw me pull out my spin once - the rest of the weekend everyone was yelling to us "pull out your whomper"
Quote A lot of people like the Code 0 on multihulls as it is usually on a roller furler therefore can be depowered easily and useful in a very wide range of conditions. Of course there is NO comparison between an H18 downwind and the Nacra 20 you tasted. Weight wise, you already know an F18 is close to the Hobie18. I'd say around 340 lbs is the safe zone to move from the F16 to an F18 w/o experience on an F18. If you're solo or under 340, an F16 may be better. Don't be overwhelmed... just start on light days, pay attention and learn from mistakes. I went from an H18 with no spin... to a spin. I rigged an N17 spin setup on my H18. It was OK. Boat wasn't designed for a spin but you could make it work. 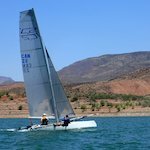 I opted for a boat designed for a spin, and found myself sailing solo more often so I moved into an F16 Blade. An older design, but a TON of fun. Ironically, it's now for sale in the beachcats classified because I'm expecting to move overseas this spring/summer. Edited by robpatt on Jan 16, 2018 - 02:42 PM. Yeah, I'm under 340, about 195 by myself. I can solo the H18 myself on light days, which we have lots of here. We get heavy winds during summer monsoons, but those days the wind might go from 4 to 40 in a blink. Have to be watchful. F18's seem to be more popular than F16's. I'll keep watching the classifieds. F16's as boats are great, well built, light enough to handle around the yard solo, possible to sail 1 up or 2 up etc. Unfortunately the class in the U.S is a bit disorganized, the boats don't carry weight much above 325lbs all that well which means in 2 up mode they are limited to smaller husband/wife teams or youth teams and in 1 up mode they aren't particularly competitive in course racing because of the high number of control lines and 1-up spinnaker take downs+hoists are a bit sketchy. All this factors contribute to the class not being super healthy in the U.S. When looking for fleets with high participation numbers and thus more used boats on the market, you basically have the Hobie 16, F18 and A-Cat. Racing outside of that is all on handicap which is fine, but it also means dwindling numbers and older boats. It's even worse here in AZ. Everything I'm looking at is far away. We aren't exactly a formula anything mecca. There are two i20's available nearby, and a couple of H16's for sale. Most people here have H16's. There are a few I20's, an F18HT, a few H18's, and a couple of Nacra 5.2's I think. I'm not a fan of the H16, and would rather just keep my old H18. It's less weight sensitive, no jib battens to hang up on the mast when tacking, and it has a better ride. It is a heavy beast, and stepping the mast is not pleasant. I considered an I20 because of the carbon mast. It rides and turns very well. It's way more power than I need, and is an older design, so part availability may become an issue and it's heavier. I already find that replacement parts for the H18 are limited (like sails, trams and hulls), and more of them were produced compared to the I20. Moving an I20 around on a slope is also a pain unless you have 3 or 4 people. We don't have big, flat beaches like in CA. But, I have to be practical also. Finding a good boat is hard enough. Getting any good rigging/tuning information is likely to be difficult on an F16 locally, as is resale. Thinking practically, I would probably be better off keeping the H18 for when my wife wants to go out, and buying an A-cat for when I want to race. We don't have a lot of space for storage though. I suppose if I had a double trailer, I could stack them. If I could find someone to crew for races, an F18 would work. They are more popular, and would probably resell easier. Although, I see lots of ads for F18's that have been up for a while. I have to admit, I am more excited by the F18. This may be because my experience on a 16' boat is on an H16 though. Edited by ropewalker on Jan 18, 2018 - 09:24 PM. Resale ??? I have never bought a boat I thought I wouldn't keep. That is likely why I am up to 5 now. Only Pete (I see he is on right now) is more of a collector than I am. Geez, 5? Are you married? Truthfully, I can only maintain so much. I'd rather sell something than let it gather weeds. I contacted someone about a used Viper and asked some questions about condition. He told me the tramp kept pulling out of the front groove, and there was a damaged shroud anchor that occurred when a swage fitting split, letting the mast fall. This apparently required cutting a hole in the hull to replace the shroud anchor, which was then patched over. I'm not certain how I'd assess the internal repair. It sounded like they had to replace a threaded sleeve, and rebed it to the internal brace. The hull patch and tramp groove ought to be obvious I would think. Thoughts? Quote He told me the tramp kept pulling out of the front groove, and there was a damaged shroud anchor that occurred when a swage fitting split, letting the mast fall. This apparently required cutting a hole in the hull to replace the shroud anchor, which was then patched over. I'm not certain how I'd assess the internal repair. Edited by MN3 on Jan 19, 2018 - 10:16 AM. Quote Resale ??? I have never bought a boat I thought I wouldn't keep. Edited by MN3 on Jan 19, 2018 - 10:52 AM. Quote But, I have to be practical also. Finding a good boat is hard enough. Getting any good rigging/tuning information is likely to be difficult on an F16 locally, as is resale. Edited by MN3 on Jan 19, 2018 - 10:25 AM. I have an '09 Viper (F16) and haven't had a lick of trouble with it. It's great boat, love it. I believe there was an issue with a fitting on the shrouds that needed to be changed out or it would cause a failure. Robbie looked at my boat and said it was already done. I don't remember the specifics of issue though I think it was a very simple fix. My wife and I got the Viper when I was pretty new to sailing (2 years) and had only sailed boardless beachcats w/out spins up until then. She had 0 experience. We took a few licks at the beginning, nothing bad. We were careful of the conditions we went out in. I second what MN3 said about visiting Red Gear. We went and spent a few days with them and Robbie got us sorted out. Quote I believe there was an issue with a fitting on the shrouds that needed to be changed out or it would cause a failure. if this "issue" was not due to some trauma, was the "fix" done on both sides of the boat? Sounds like someone forgot to put tape on a ring ding and the pin came out. They did have some shroud anchor tang issues as others mentioned above, the repair was to screw a new beefier one into the hull if I recall. C2's are subject to the same issue FYI. Tramps have been pulling out of slots in hulls since they were invented. Couple reasons there, it is possible the slot is cracked, equally possible the tramp itself is worn out. Neither are major issues and both are quick fixes (epoxy for the first, new tramp for the second). I20's are great boats. The only parts that are an issue really are the daggerboards and masts. The rest of the parts are primarily interchangeable with the Nacra Infusion so good availability there as those boats are still in production. I cannot advise single handing this boat-there are guys at our club who occasionally do, but only when other boats are around to rescue, as self rescue is difficult at lighter weights. The masts do step pretty easily but they are still a tall rig and very expensive/impossible to replace so definitely a 2/3 person job. Locally a heavy team weighed an I20 vs. F18 (tough call because we sail in light winds and have a strong local I20 fleet), they ended up getting a C2 and are happy with that decision. Its a much newer boat than any of the I20's out there and well sorted, plus they have won races in lighter conditions on it. There are some F18's on the market right now, but if you notice not a lot of Infusions (none I believe). Infusion Mk. 2's took the top 5 spots at last weekends Bluster on the Bay Regatta. I'm not saying C2's aren't competitive-they most certainly are in the hands of skilled sailors, but in the U.S there are more competitive teams on Infusions it seems so the knowledge base is a bit higher. That drives the resale value of Infusions Mk. 2's up a good bit. Also, in terms of difficulty finding a boat, I would throw location to the wind initially, and focus on getting the boat you want at a price point you can accept. As I explained to a friend recently, you are shopping for a Bugatti Veyron, very few were built and as a result you have to expand your search region to find what you are looking for, or settle for something you aren't. Good point about self-righting. I'd have to check if I can get enough leverage from a "power" pole attached to the dolphin striker with lines or a righting-bag to right an F18 myself, but certainly the lighter boat would be easier in that regard. I've been thinking about the location issue: flights are expensive, and I just don't have time to take off to drive 30+ hrs each way to go look at a boat. This may mean I miss out on a good used boat because I can't get there fast enough or don't recognize it for what is it and don't even book the trip. There are three F16's I'd want to look at: Nacra, Goodall, or Falcon. It looks like the Viper is the favorite. The sure-thing would be a 3-4 year old demo boat from one of the dealers, at 60% above my budget. Of course, if a boat has been there that long, perhaps they'd be willing to negotiate some to get it gone. It doesn't hurt to check. For the Viper, there is the side-benefit of letting me get some lessons on the boat (I'm thinking Red Gear Racing), which would certainly be beneficial. The Nacra dealer also has a 2013 boat for sale. They aren't in a pleasant place to visit this time of year. We can still sail here . For a F16 it would be Goodall or Falcon. The Nacra has sorted out the issues but they are still a lesser known quantity and may be more expensive. If you are serious about a Viper I will inquire with my local guy if it's for sale and how much. Uship could drive it out and I can certify it for a nominal fee. Thanks Sam. See what he wants for it and PM me if he's interested. After much back and forth, I decided to check out a couple of boats on the west coast. One was an older Nacra "Mk1" Infusion, the other was a 2012 C2. I like the F16's, but they just aren't as available. The C2 is in extremely nice condition, and I made an offer on it. I'm going to go pick it up this weekend. The seller is a very nice guy, and knows this boat. I'm excited to get this out on the water with him. Sold the H18 today, so my wife is happy that we'll still only have 1 boat in the driveway. I have skippered an older Capricorn and it was a great ride!